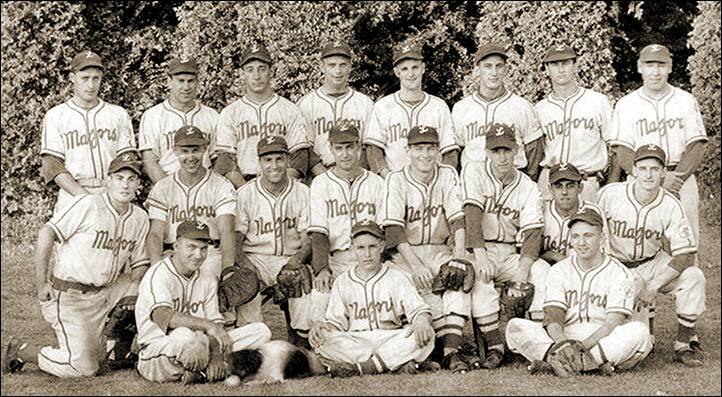 BACK ROW (l-r): Unknown, Gil Robertson, Joe Bechard, Tommy White, Joe Black, Lou Bloc, Jack Parry, Gord McWaine. MIDDLE ROW: Gord McMackon, Jack Fairs, Russ Evon, Clare Van Horne, Don Cooper, Bobby Rose, Frank De Luca, Ken McFadden. FRONT ROW: Joe Ladensack, Bat Boy Bill Dixon, Tom Burgess.